As they were completely engrossed in their work, they did not notice the looming threat of flash flood. SRIKAKULAM: Two farmers who spent more than 10 hours clinging to the branches of a tree surrounded by floodwaters were rescued by a team of the National Disaster and Response Force (NDRF) at 3 am on Saturday. Sanapala Krishna and Kuna Madhava Rao of Chinnamatalabupeta of Sarubujjili mandal had left on Friday afternoon to check the condition of their paddy fields. As they were completely engrossed in their work, they did not notice the looming threat of flash flood. By the time they realised the danger, it was already late and, left with no option, they climbed a nearby tree to save themselves from the raging floods. Increasing inflows into Gotta Barrage in the wake of heavy downpour in the upper catchment area of Vamsadhara river in Odisha prompted officials to open the gates of the barrage to release flood water downstream. The duo were not aware of it as they had already left for their fields to assess the damage to their crop. As the hours went by, the flood levels only increased and they could not climb down the tree. Meanwhile, the families of Krishna and Madhava Rao were worried. Their worry only grew as the duo had failed to return even after 7 pm. The villagers after learning that two of their men were trapped in the floods alerted the police and revenue officials. By the time, the officials got the facts straight about the fate of the two farmers, it was too late. Following the directions from Joint Collector KVN Chakradhar Babu, fire officials rushed to the village, about 40 km from Srikakulam. Although they made many attempts they could not reach the victims due to the menacing force of the floods. Meanwhile, the NDRF teams reached the spot on the directives of the authorities and got into rescue operations. 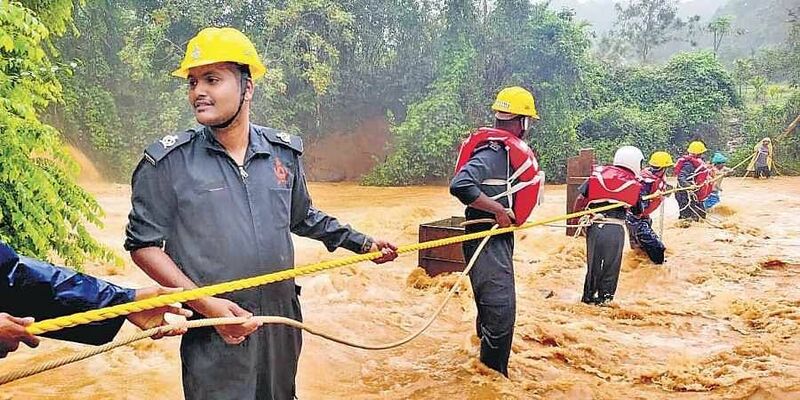 After four hours of efforts, the NDRF team brought the duo out of the floods safely at 3 am, according to Chintapalli Nagabhushana Rao, a resident of Chinnamatalabupeta. The families of the two farmers and the villages thanked the NDRF team and officials for saving the lives of the two farmers.